Irish Loop on the Avalon Peninsula, Newfoundland. It was a little late in the morning when we said our farewells to our generous friends in St John's, it was a luxurious week and we were treated like royalty! As much as we could've stay another week, it was time for us to move. We'd already spent over 2 months on the "Rock", and summer's end was only really another month or so away and we wanted to get through Nova Scotia and New Brunswick at least before then. We waved farewell and headed into the city for one last stop at Mile 0 on the Trans Canada Highway, a highway which spans the whole nation of Canada - that equals a long way! Our first stop was in the town of Ferryland which is also known as the Colony of Avalon. The area has a history dating back more than 500 years which includes peoples such as Beothuk Indians (who are now extinct) fishermen, and European settlers. Ferryland is thought to be one of the earliest European colonies in North America and was founded in 1621. Although we intended to visit the lighthouse which was constructed in 1871, the road was pretty rough (too rough for our camper) and long and we wanted to make it through the Irish Loop drive in that day, so decided to continue on our travels. Next stop was quite a bit further round in St Mary's Bay on the southern shores of the Avalon - still part of the Irish Loop. In case you're wondering, the Irish Loop covers a part of the Avalon which was widely settled by Irish immigrants. Many of the communities have retained their Irish culture and heritage - the accents and language of the people even gives the feel of Ireland! A look out point in the town of St Vincent's provided a panoramic view over the Holyrood Pond and St Mary's Bay as we headed north again on highway 90. 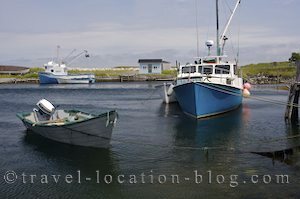 Completing the Irish Loop drive we decided to stay a couple of nights in Bay Roberts - lucky decision as the weather turned bad again for the next couple of days.